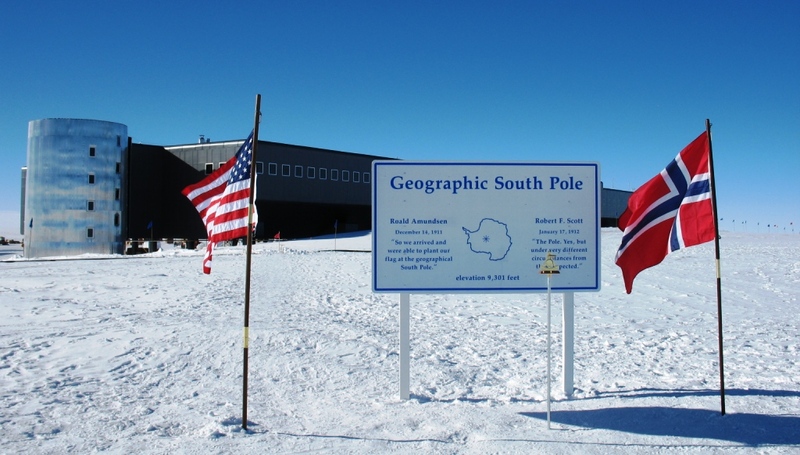 With the upcoming centennial, a Norwegian flag has been added to the geographical South Pole marker. A new sign has also been installed there, though the content is the same; it’s just a whole lot bigger. This is, as things work down here, actually the surface location of the geographical South Pole as of 1 January, 2011. The first day of each calendar year, the marker location is updated to its present position. The reason the marker apparently moves is because the ice sheet that constitutes the Antarctica Plateau is slowly moving at about 10 meters per year. As a result, the updated positions of the pole appear to march across the landscape in a line, but it is the landscape (or, icescape, if you prefer) that is actually moving. The pole marker itself is actually from the 2010 crew with which I last wintered. We selected a design during the winter, and the following summer it was installed at the new/current geographic pole location on New Year’s Day. Similarly, on 1 January, 2012, we will update the pole location using the marker (kept secret from the public) selected by the 2011 winter crew. The machinist each winter is who actually fabricates the actual marker article. 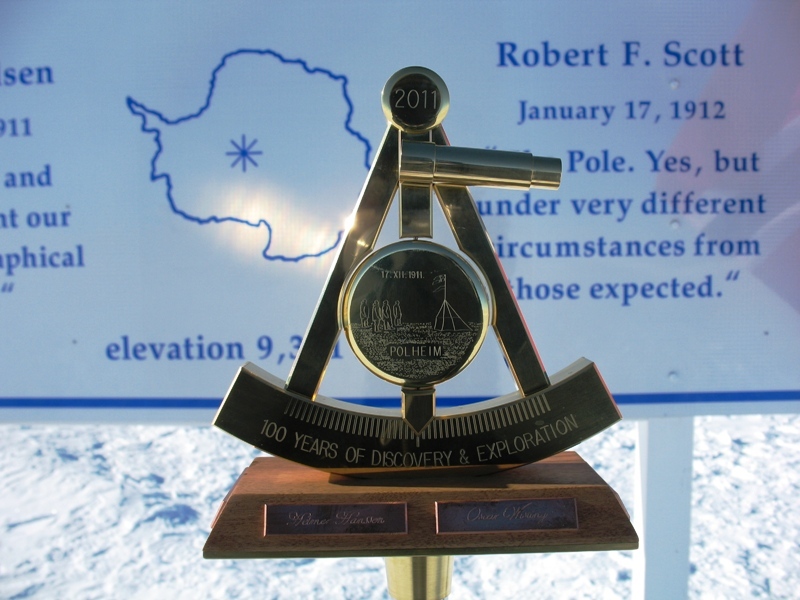 Loved your article and photo of the new "Geographical South Pole" sign and marker. But, since our company, ARA Signs made this sign*, its probably no surprise that seeing your blog and a photo of our sign "made our day". * plus many other signs ordered by Raytheon for the USAP, including the "Welcome to Amundsen-Scott SPS" and signs for Palmer, McMurdo, ASPA, Pegasus Airfield etc. Have been planning for some time to add a "photo gallery" to our website, www.arasigns.com , but one of those "back-burner" things. I was hoping to get your permission to post your photo on our website (plus any other photos you might have and could send to me: dave@arasigns.com ). I'd also love to send you a "comical" photo of the same "GSP" sign we took next to "our pole", a Saguaro cactus on our property here in the desert U.S. southwest (Las Vegas, NV area); about as "180 out" from its intended location. By the way- nice article. I am writing to you for one reason, I have a question; Can you please give me your permision to upload the lovely photography of the geographical south pole to wikipedia? I would really appreciate an answer, and if the answer is "yes", I would be thrilled. And if so, thanks a lot.